Reading this one for a second time - Dani Johnson authors "Spirit Driven Success" Whoa, this one has opened my eyes to "Purpose". The thing that keeps coming to mind is being trusted with what I have so I can be trusted with more later. I'm really working on "Blooming where I am planted" and my own personal and professional "Influence". How to use these things for God. Wow, this book is taking me on such a journey. 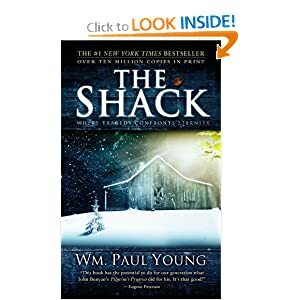 "The Shack" by William P Young. I sat this one down a few weeks ago, not because I wasn't enjoying it, because tragedy is about to strike. The question is, "can I get through it?" My friend, who loaned it to me, has said she did the same thing, grab a box of tissues and get ready to sob your way through it. Uh, my excuse? Puffy eyes are SOOOO not cute on me. I'm going to get the courage up because people RAVE about this book. Kleenex, would you like to sponsor me to read this book? "Laughing at Wall Street" by Chris Camillo - what a great investing book and so relevant to this day and age of technology. Since our information systems move so rapidly there is no longer any use for taking months to research a company to buy stock in, we get most of our information from the web, which changes every. single. moment. This book reveals how to pick winning companies, and quickly. I've gotten about half way through this book and need to start over from the beginning. It's so full of information it would be a great "book club book". I'm the same way. I start a lot of books, but don't finish them. I'm about 3/4 of the way through "The Shack," and a few pages away from finishing "Laughing at Wall Street." BUT, I am just a chapter away from finishing the 3rd book in the Hunger Games trilogy - those I haven't been able to put down! My nightstand is piled halfway to the ceiling! I'm finishing up Sarah, a fictonal book about Abraham's wife. Next up is Lulu in the Sky, the 3rd memoir by Loung Ung, a woman who escaped from the Khmer Rouge as a girl. I'm so hot & cold with books. Love them. Adore them really. Tend to let all else slide if I'm really into one. Like dinner for family, car pooling, showering. That's not good. Then others, while good reads, tend to get the half read. I either fall asleep mid chapter (not good in the kiss & go line at school) or I see a squirrel. I'm finishing Outside The Lines by Amy Hatvany, The Soldier's Wife by Margaret Leroy-both equally terrific. I loved Come to the Edge by Christina Haag, about her love affair w/ JFK, Jr. Next up for me is Bunny, Bunny Gilda Radner by Alan Zweibel. I loved her, met him recently, I can't wait.